"I am following your instructions to create a working example based on your article. 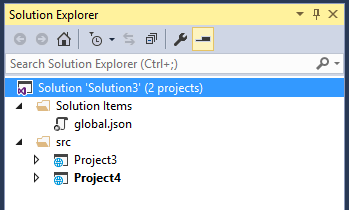 After creating the project my solution explorer looks different than your screen shots. Why is so? Am I missing something?" Well. That's actually because of a simple setting. But it is always good to know why things are happening in the way they are. 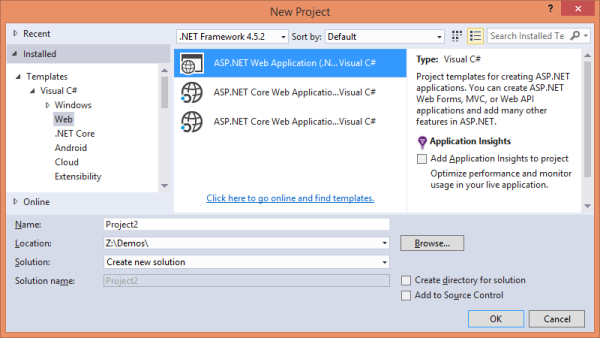 So, in this short post I am explaining why you see two different solution structures in Visual Studio 2015. 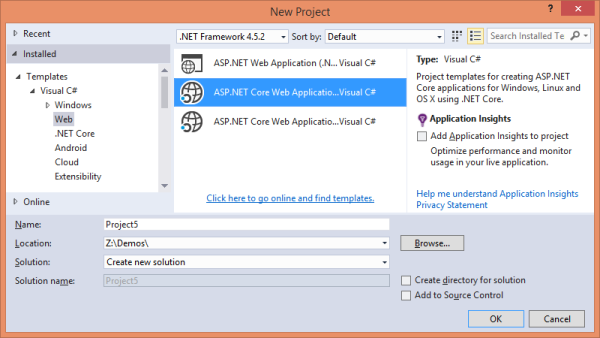 Let's create a new ASP.NET MVC 5 project using Visual Studio 2015. Notice that under the Demos folder you have Solution1 folder because you selected the "Create directory for solution" checkbox. 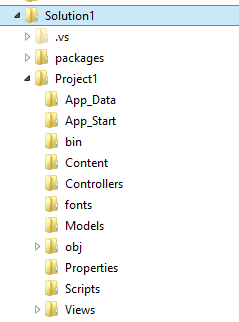 Inside, you have Project1 folder that contains all the project specific files and folders. 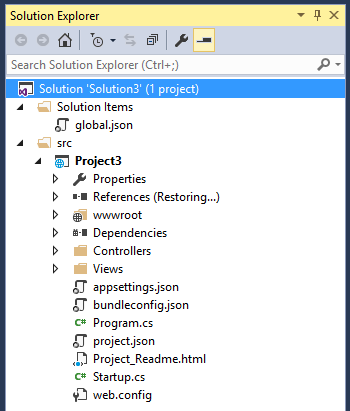 Now, create a new project again but this time uncheck the "Create directory for solution" checkbox. This time Project2 folder (the folder containing project's files and folders) gets created directly inside Demos folder. 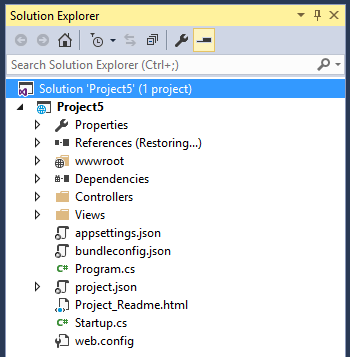 There is no separate folder for solution since you unchecked the "Create directory for solution" checkbox. So far so good. 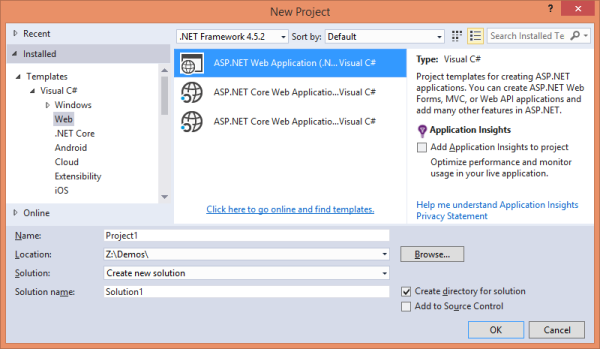 Now create a new ASP.NET Core project by checking the "Create directory for solution" checkbox. There are two top level folders - Solution Items and src. 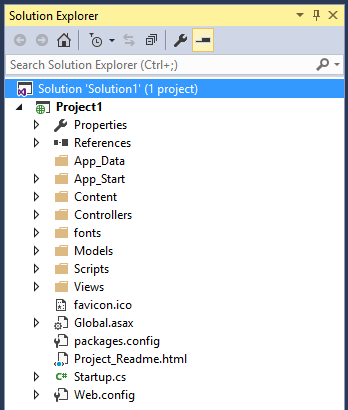 Solution Items contains global.json file. 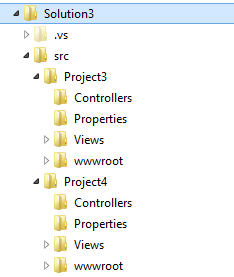 Src folder contains the project - Project3. You may ask - Why this structure? That's because this structure closely resembles the GitHub project layout. Since ASP.NET Core heavily uses OSS, the new solution structure mimics what people using repositories such as GitHub are familiar with. You are not limited to these two folders. You can, for example, create Tests folder to store unit testing related things and Documentation folder to store documentation files. 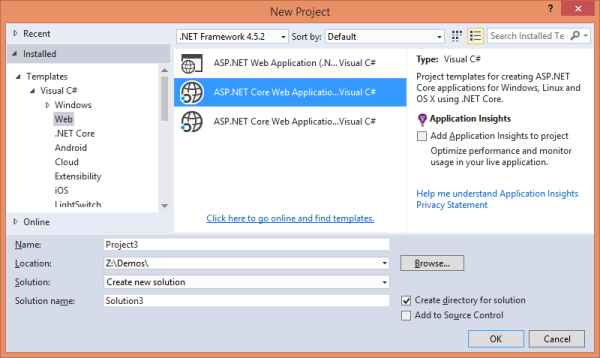 Now you may ask - Can I continue using the older solution structure in ASP.NET Core also?